Boyfriend trouble? Try dating a ghost! I knew the boy was different when I saw him walk on water. When fourteen-year-old Skye Thackery meets Owen Wicks, it's not exactly love at first sight. She's getting over a broken heart and he's, well, a ghost. But as Skye gets to know him, she can't help wondering what it would be like to kiss him. Dating a ghost isn't easy, and things get worse when Owen declares he's found a way to stay with Skye forever. As Owen prepares to risk everything, Skye wonders if his desire to be more than just a ghost will cost them everything. 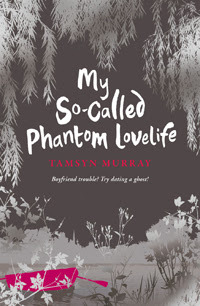 Tamsyn Murray is an author that I will probably always remember throughout my life. She's one of the most talented authors I know of and her way of writing is brilliant. Her writing is humorous and fun, and is even better when she's writing as a teenage girl. She seems to get inside the head of a teenager so well, and you find you can't put her book down! Eventually Skye and Owen become very, very good friends. But Owen has a mysterious, hidden past that we don't really get to know about until later in the book. Also past characters from other books in the series play big parts in this book too which is great. I really love this book! It's full of humour, drama, ghosts and scary moments...it's perfect! 5/5! I really enjoyed this too! Great review, Amber.